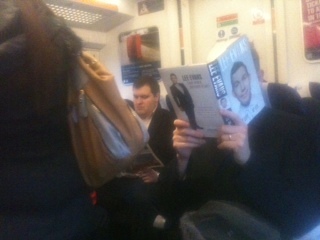 4th December 2012, 9:15am in a train from Bromley South to Victoria. I am entering a packed train with no seats free except in the first class. People are squeezing. The 1st class section with 12 seats has only one person sitting. Looks like no passengers has a first class ticket. - I have no 1st class ticket but I sat here anyway. - Me neither but I have never seen anyone checking tickets on this route – I say. We joke a bit in a relaxed way and loud enough for everyone else to hear. So she is a leader of the new social movement and I am her first follower and we are having a good time. So now we have 12 people committing the same “crime” and there is no way the ticker inspector can fine us all even if they did come around.